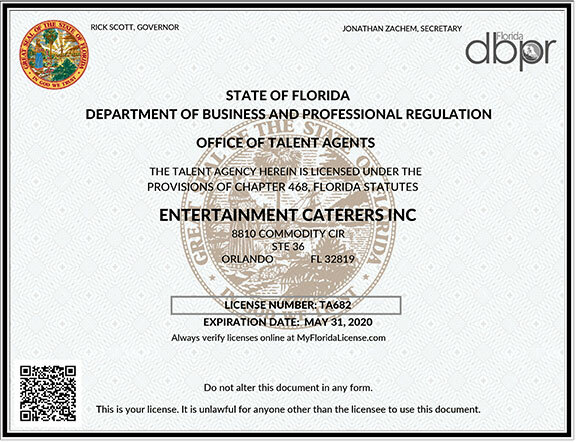 EC Model & Talent Agency is a Division of Entertainment Caterers, Inc., a licensed and bonded Orlando, Florida Talent Agency #TA682. Here, we provide a Comprehensive Talent Database connecting Talent and Clients nationwide, and even worldwide through advanced Geolocation Search, Talent Category and Skills Matching criterion. We also feature a Job Board where Talent can post their resumes, and Talent Buyers can post their event needs. CLICK HERE to Join for FREE! Great work starts with the best local Talents! Get amazing results working with the best Talent, available from ANY Industry... from trade show models to cirque artists, talent buyers to event promoters and any other top local professionals you can think of! Find local, regional, national and international Talent with confidence. Lets get started! Looking For An Elite Industry Professional? Choose from one of our recommended providers below. We have core groups of professional trade show models in most major cities. Get a Great Website for your Business! EC MEDIANET can create a new website for you, or update your current website. Search our expansive database to locate the prefect talent for your next event. Let clients find you faster by using geolocation technology for fast searching. Begin advertising yourself to thousands of clients for great jobs. Start Today!